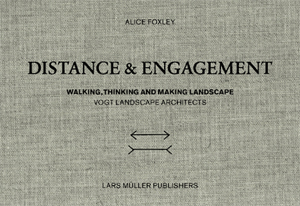 Günther Vogt and his landscape designers bring a lot of passion to their research and to their search for ideas for transforming undesigned sites or tracts of land into landscapes. They don’t want to depend just on knowledge acquired from books. They venture out into the landscape at all times of the day and year and interrogate what they see there. They make room for art and science in their studies and use the same tools to turn their landscape designs into reality. Most of their “field trips” begin out of curiosity based on something they’ve seen, heard, or read. Against this backdrop, they explore, among other things, fortifications in France, the Upper Rhine in Switzerland, and national parks in England. 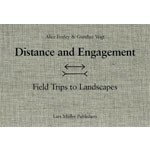 The results of their “field trips,” research projects, and practical implementations are collected in this publication. The results of their “field trips,” research projects, and practical implementations are collected in this publication. “Distance and Engagement” takes up where “Miniature and Panorama” left off and shows not only what Günther Vogt is working on but also, and above all, how he works.